17,74 € 17.74 tax incl. 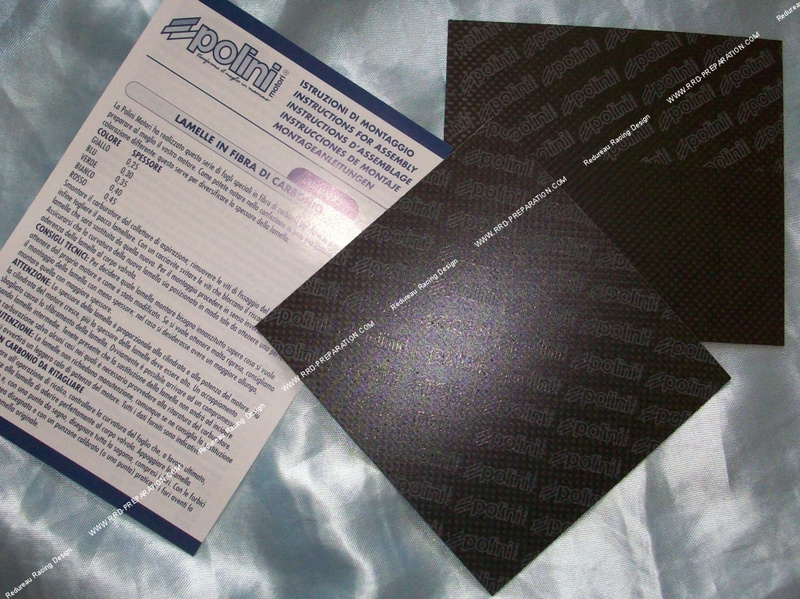 POLINI motori boards are based on high quality carbon fiber, they are cut out by themselves. The boards are 2 in number and 110mm by 110mm (11 X 11cm). You have to choose between these thicknesses: 0,25 / 0,28 / 0,30 / 0,33 / 0,35 / 0,40 and 0,45mm. Carbon allows a more frank admission, less harmful vibrations ... therefore higher performance. A harder valves will offer more high revs but less torque (it will come into self vibration / resonance range) later! The softer valves will start vibrating earlier, more acceleration but the motor will buckle at a lower revs. You will have to find the right compromise. In order to cut your slats of valves after having carefully trace their shape, a simple pair of scissors will suffice you. Assured builders will certainly appreciate the many sizes available and the quality of these slats to achieve maximum performance with their engines!